Hey there! Thanks for dropping by Matthew Roddy in England! Take a look around and grab the RSS feed to stay updated. See you around! Most of the campus photos I stole from Andrew so I have to give him credit for those. Even though I left England on Saturday December 15 I was not headed home just yet. I was going to be spending a few days in New York with my cousins. I have never been to New York and have always wanted to go, so I was pretty stoked. My plane landed around 8pm and I couldn’t wait to see what the night held, however I had a problem on my hands. I got through security and baggage claim and now I had to find my cousin. The problem was that I did not know where to go and my phone was dead, not to mention that I had a 50 lbs duffel bag, whose should strap had broken. So I looked for Bill for a while and couldn’t find him so I started looking for an outlet, also could not find one. I asked a security guard, she was no help. Finally I found one that had an electronic check-in plugged into it but there was another outlet, however someone else had their phone plugged and they were no where to be found, so to search some more. I walked up and down the check in area about six times until I finally found one got my phone plugged in and found Bill. We went back to their house on Staten Island, where his wife Michelle made some amazing food. Joanna, who is a senior in high school had some of her friends over for a Christmas party. I spent the night talking with Bill and Michelle. Michelle and I walked their dog so that I could see some of the neighborhood, from one of the streets you could see the Liberty building and she told me that she was standing there on 9-11 and saw everything. It was a nice relaxing night. Sunday morning we watched some football and then decided that we should do something that afternoon. I asked if we could go to the 9-11 memorial and then they wanted to take me to Rockefeller center Time square and all those cool places. We took the train then the Staten Island ferry and started a night of adventure. I had so much fun. I saw the Statue of Liberty, and Ellis Island while I was on the ferry. We then started off with the 9-11 memorial. I have wanted to visit this place for so long and was very impressed by it. Bill knew some firefighters that had lost their lives on that day and we found their names. It was such a great place to remember and honor those who lost their lives on that day. We then went to Qdoba to eat because that is where Joanna wanted to and I did not have a problem with that. We then went to Rockefeller Center and saw all the Christmas decorations, the tree, and the ice skating rink. It was crowded but pretty awesome. We then Headed to Time Square, we walked around there for a while did some shopping and then headed home after a few hours. We got back and Michelle made another delicious dinner and then we just hung out for a while. We called it a semi-early night because Joanna had school the next day and I was flying out in the morning. Monday morning I said goodbye to Joanna when she left for school and then a few hours later Michelle took me to the airport so that I could finally be home. I am so thankful that I got to spend a few days in New York with Family. It was such an awesome experience and I can not wait to go back for another visit. Thanks for reading my blog, I hope you enjoyed it! A year ago, going to England to study for a semester was merely a thought. Never did I really think it would become a reality. I only wish now that it would have been a year long and not only for a semester. I think that it really hit everyone on Monday December 10. Saturday December 9 many of us had our first exam which started to shine a little light on the fact that we only had a week left at Essex. At Essex you don’t have a bunch of homework and then an exam or two. You are expected to read certain articles or books each week and show up for class and lecture to discuss the readings. At the end of the term you are to write a final paper discussing one of the topics discussed throughout the term at roughly 2,000 words each. You then also have to take an exam over the course. The exam does not include multiple choice or fill in blanks, they are strictly essay. You are to respond to two questions with an essay per each. It is expected that you will write two to three pages for each response, and even make some references. So they way may final week looked I had exams on Saturday, Monday, Wednesday, and Thursday. With a final paper due on Monday and three due on Thursday, and of course per my usual procrastinating self I did not start the papers until the night before they were do. However, I do feel that I did quite well on everything. Along with all of this I had a test in my Social Anthropology class on Tuesday. One of the most shocking things to me was at the end of my Soc. test on Tuesday. This is a two hour long seminar, so it’s class and lecture put together. Are test was only to last an hour so I figured we would just get out earlier. So this is how it went down. I was sitting there in the front row taking my test and the teacher leaves for about 15 mins, he comes back in with some kind of duffel bag and I was confused on what this guy was doing. Well right at the hour mark I hear the popping of a champagne bottle. Turns out that every year at the end of the term my teacher brings in things to make mimosas for his classes. So at noon the test was over and this guy was serving us mimosas, that is most definitely something that would not happen back in the states. Monday is the day when we we all realized it truly was ending. Monday morning George was the first flatmate to leave. The last week was pretty crazy. Only study abroad students had to take exams and turn in their papers that week, the rest of the students had latter dates to turn in their stuff. So as we are trying to study and write papers, everyone else was partying and going out and having a good time celebrating with their friends one last time before break. This only added to the stress levels of my flatmates and allowed me to procrastinate a little longer. Tuesday the climbing club had their club Holiday Dinner. We went to Tony Carvery’s, this is like a buffet sort of deal. You get four cuts of meat anything you want and then you are able to get corn, mash, stuffing, rolls, green beans, and pretty much any other side dish you can think of and you can go back as many times as you want to refill on sides. It was pretty delicious and we ended up staying there for about three hours just hanging out. To finish off the night about 15 of us went to the SU Bar for one last time. the rest of the week was spent doing studying and writing. Thursday was a day we were all waiting for, everyone’s last final was at 6pm that night. So we decided that once everyone is done with their exams that we would have a flat night. We would spend our last night with everyone in our flat just us hanging out, it was a great night! The next morning is when the second member would leave, so we said goodbye to Amanda Friday morning. During the day Friday Bethany, Sydney, Andrew, and I went into Colchester for one last time. We decided that we should go see the Hobbit so we did. We then got back to the flat and prepared our selves for a night out. We knew that the last night there that we would have to take in England and all it’s glory one last time. Niki and I decided that we would invite some climbing people over and then everyone would go to SU bar and back to our place after that, so that’s what we did. Saturday morning was the day that this mere thought became a reality that was ending. We first said goodbye to Gladys and then an hour later it was Dom and I’s turn to leave. We said farewell and the girls cried. We had booked a bus to take us to Heathrow airport so that we didn’t have to mess with all of our luggage on the trains. The bus ride took a few hours and we were glad that we had a little time to talk and nap before our final destinations. We finally go to the airport and walked awhile until we came to a fork in hall and she had to go one way and I the other. I gave her a hug goodbye and she started crying, for all of you who know me I do not deal well with people crying. So I just said have fun for the rest of you time here, because she was staying for a few weeks, and told her that we would meet up again because she only goes to school four hours away. I find it ironic that we were the first ones to meet each other in September in New York and that we were the last ones that each of us were with, We started it together we ended it together. This was by for the best experience of my life. I already miss it and wish that it hadn’t gone by as fast as it did. It’s hard to put what I learned into words, or few sentences, it would take me hours to explain everything. That day I left in September I was nervous leaving everything I knew and my comfort zone behind me for a few months, now I am so thankful for that day. That day was the start of something that I will never forget and and experience of a lifetime. That day also led me to met so many great people and nine people that I have the privilege of calling great friends. It as started me on a journey to explore the world and the people that share this planet with me. To Gladys, Jeremy, Sydney, Bethany, Andrew, Amanda, Dominique, Niki, and Eveline thank you for the great memories that you have been a part of and being such great flatmates. I hope to see you all again someday. Thank you is not even close to what to what needs to be said but that is what I have to offer here and now when I only have a limited amount of space. This was something I will never forget. I encourage everyone to take the opportunity to study abroad and if you have questions let me know. Early Thanksgiving morning Sydney, Niki, and I began our journey to Paris for the weekend. After about 13 hours, a taxi, two trains, a bus, a ferry ride across the Chanel, and another bus we had arrived in Paris. However, our traveling was not done for the day. It was about 6pm and we still needed to find the apartment we were staying at. So we took two more metro trains to the Villejuif area and began our hunt for the apartment. Niki had directions to it from the stop so we figured easy going, wrong! It took two hours until we decided to give up and call a taxi, the ride lasted about 5 mins. O we, well I, found out that those metal pillars that prevent cars from entering somewhere, yea they go down when you sit on them. The apartment we were staying was pretty decent for the three of us and the price. It had a bedroom, living room, small kitchen, and a bathroom. We decided to take it easy that night since it was already 8 so we ate dinner and just relaxed before going to bed. I of course was a gentleman and let the ladies have the bed and I slept on the futon in the living room. The futon ended up being broken and very uncomfortable, but I managed. Friday morning we left the apartment around 8am so that Sydney could meet up with her classmates and teacher at 10am. We decided that we would have some croissants for breakfast, this was a wonderful idea. They have all these little bakeries and bread shops, and they are by far the best croissants I have ever had. Niki and I left Sydney to explore the wonderful city of Paris. We walked around the area we left Sydney for a few hours. There were so many little shops and the people were very nice. It was pretty cool we would be walking down the street and there would be a cheese shop, then two doors down a wine shop, and then another cheese shop. They also had a lot of open produce shops. The two of us then headed of to the Opera district. Here we stopped at a little sandwich shop and had lunch. We then were on a mission to find Fragonard Parfumeur to find my mom a gift. The ladies in there were extremely helpful and luckily I had Niki to help me pick out scent and be a tester for me. We continued to walk around the district for a while going into some shops and other stores. We would go into these massive department stores that were 6 floors to look around and kill time. We found it odd that each store would have baby clothes on a floor then women’s clothes on a few, then suit cases, then some other random stuff, however they never men’s clothes. It took us about all day to realize that the men’s department was in the building across the street connected by a catwalk. Niki is obssesed with Starbucks so we had to find one and we did. Here she ordered her coffee and we both wrote postcards. 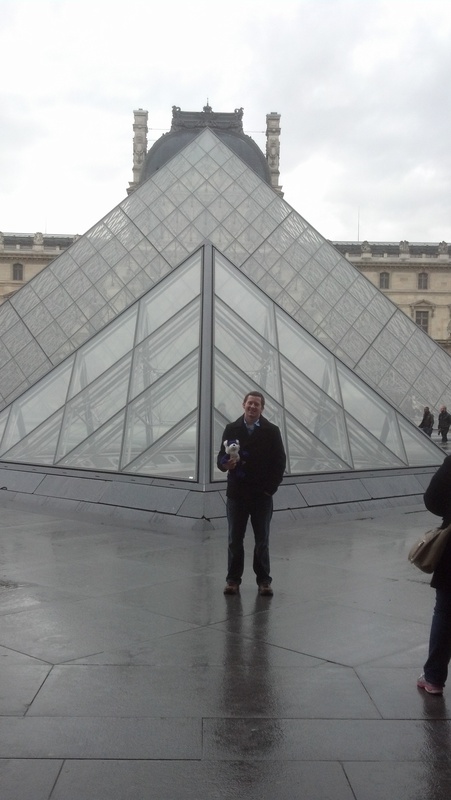 After awhile of pondering the Opera district we headed to the Louvre to meet up with Sydney. We got there earlier than we were suppose to so we decided we should do some more sightseeing. We walked around the outside of the Louvre saw and walked through the Arc Du Carrousel, which is located by the Louvre. We then walked through the Jardin Des Tuileries which is an amazing garden between the Louvre and Place de la Concorde. We went to Place de la Concorde saw the fountains and Cleopatra’s Needle before moving on to the Christmas market. The markets were located on Champs-Elysees,which is a very famous avenue known throughout the world. The Christmas market had a lot more food than I expected. They had stands for cheese, sausage, all kinds of different cultural foods, mulled wine, cider, candy, chocolate, and a few that had hand crafted items. We continued our way down Champs-Elysees toward the Arc de Triomphe. We only made it halfway there before we had to turn around and meet Sydney back at the Louvre. After about an hour of waiting Sydney finally found her way to us. We were going to go in to the Louvre, however Sydney had gotten lost because her classmates told her the wrong direction and we all decided that it had been a long day and we should go home, so we did. Saturday we slept in till 10am and then headed out for another fun filled day. We Went back to the Louvre and walked to the Christmas markets again because Sydney had not seen them and Niki and I didn’t really stop to look at anything. We took our time in the market where they had these massive doughnut things filled with chocolate and Niki had some mulled wine. We then headed back down Champs-Elysees. We of course went into some of the shops and bought some items. I mean we were on one of the most famous shopping streets in the world, what else were we supposed to do. We also made it all the way down to the Arc de Triomphe. After walking Champs-Elysees all the way back to the Louvre we decided it was time to go to the Eiffel Tower. Walking up to it felt surreal. We decided that we should climb the Eiffel Tower to the second landing because it was cheap and a once in a lifetime experience. So we climbed it. It was pretty cool because we got to watch the sunset over Paris from the Eiffel Tower. After climbing the tower we decided we would call it a day. We headed back to our apartment to end the night so that we could rise early and head back to school. I have always heard that the French are rude and that if you didn’t speak French they wouldn’t be very kind. I found this to be very wrong. Niki and I do not speak French and Sydney knows some but isn’t fluent in it, and everyone that we met was very nice and helpful. I felt bad because I did not speak their language but I tried. I was very thankful the second day when Sydney was with us though. 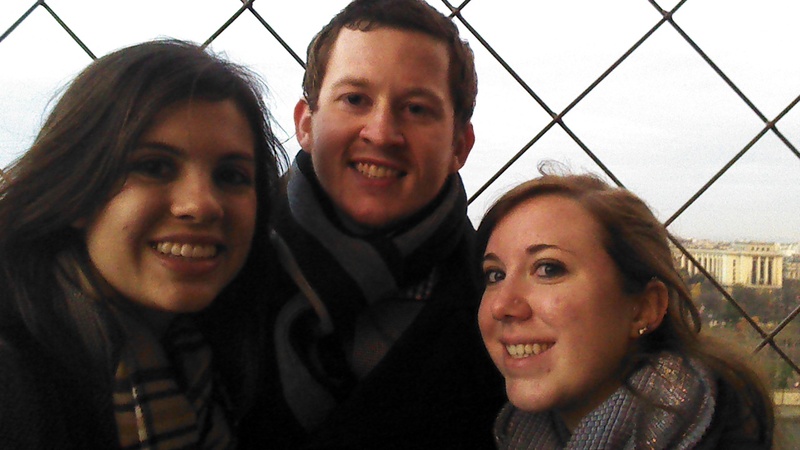 Paris was amazing and I’m glad that I was able to spend it with two great people. The only complaint I have was about our shower. So in our bathroom there wasn’t a stand up shower, it was a tub with a sprayer attached to it. Needless to say whenever I took a shower/bath there was water everywhere. I do not like this bathshower thing and hate it. However it could be way worse, at lease I had hot water….well once. Letting Niki take a shower first was a bad idea and resulted in a nice cold spray down for this kid. Overall a great experience and I wouldn’t trade it for anything. First I would like to apologize for not updating in a while but it seemed like there was nothing to write about and now as I sit here ready to write this I realize I have so much to say, so prepare yourself for a long but fascinating telling of my life in the past few weeks. On November 12 Dominique, Andrew, and I went into London and saw Wicked the musical. I have never been to a musical before and was honestly kind of skeptical about going. I didn’t even really know what it was about or how the whole night was going to play out. I will now admit that all these feelings were foolish, it was an amazing thing to see. It was such a good play and I am so glad that for my first musical I was able to experience it in London. On November 18 a few of us went to Clacton-on-Sea, which is a town about 45 mins away from us by bus. Amanda, Kourtney (she lives upstairs), and I went to a tattoo convention. I have never been to a tattoo convention so I didn’t really know what to expect when we got there. However, I thought it would be like a fair with a bunch wild and crazy stuff, it wasn’t. It took place inside of a building outside of town, and there were about 50 booths set up representing all different tattoo shops and artists. The artistry that was represented there was outstanding. As you walked through the aisles there was someone getting a tattoo in almost every booth. No I did not get a tattoo while I was there, but Kourtney did and it turned out great. After spending a few hours there we went back into town and went to the seaside. Luckily for us the sun was setting so the view was even more beautiful. We spent a few more hours just walking along the beach, taking pictures, and playing a few games at the arcade located on the pier. Tuesday the 20th was a big day for us. We decided to celebrate Thanksgiving on Tuesday because a few of us would not be “home” on Thursday. My flat nominated me to make the turkeys and do most of the cooking, I love to cook so this was ok with me. Niki and I buttered and seasoned the turkeys in the morning and put them in the oven to bake. Throughout the day we all pitched in with helping cooking items. We snapped and washed fresh green beans, peeled potatoes, made apple pie filling, and basted the turkeys as a family. around six o’clock the real cooking began. The turkeys finished getting crisp, Jeremy started his mashed potatoes, Niki made green bean casserole and sweet potatoes. With all of that we also had dinner rolls,croissants, cranberry sauce, turkey gravy, and an attempted stuffing. For dessert we had pumpkin and apple pie along with vanilla ice cream and whip cream. We invited the Americans from flat five to come down and join our flat in our celebration so there ended up being 16 people at dinner and George and Shane ate when they got off work. My flat did all the cooking and flat five only had to being the drinks,which turned out great. We had cheese and wine to start the night off at 7, had the ceremonial cutting of the turkey, done by yours truly, then started eating. As soon as everyone had gotten a plate of food we decided to go around the table and say what we were thankful for. The things that were said were very nice and almost all pertained to how glad that person was that they had this great experience and got to meet all of the great people they are sharing the night with, some people even cried. Jeremy, Gladys, and Evelyn said it was a great first thanksgiving and they were glad that we decided to share the day with them. Even though I was not able to be home with my family for this day I was thankful that I got to celebrate it with my flat family here, this night is one that will never be forgotten. Stay tuned for my Paris trip and other fun things. Yes I took Bogey with me to Scotland, however he did not go out in public. 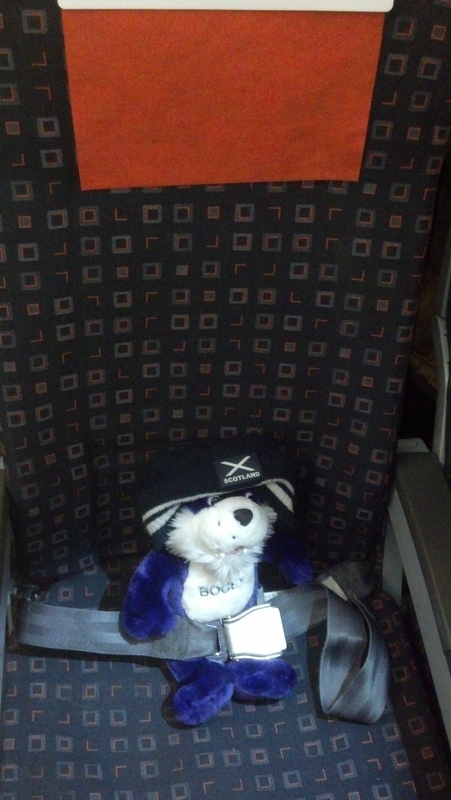 He did enjoy the plane ride back to England though.